Next, properly prep your deck. This is the most important step of the deck staining process. Properly prepping your deck will ensure your stain can properly adhere and penetrate the wood. Failing to properly stain your wood will lead to deck stain failure prematurely. The cleaning or stain stripping followed by brightening should be done at least 48 hours prior to applying the stain unless you are using Restore-A-Deck, which can be applied the same day as the prep. On staining day, make sure there is no rain in the forecast for at least 12-24 hours. Remove all furniture from the deck and surrounding areas. Protect all shrubs and flowers with plastic tarps but make sure to provide enough room for them to breathe to prevent suffocating them. If there are any concrete patios nearby, it is a good idea to cover those too. We recommend the use of stain pad applicators or a pump type sprayer. The stain pads allow for flawless, even application while pushing the stain into the wood to prevent stain puddles or dripping. Spraying your stain makes it fast and easy, but it is prone to over applying or uneven application. if you use a spray, make sure to back brush for an even appearance. Always start with vertical surfaces such as railings. Using the stain pad, apply the stain from the top down. Do this in sections of 4-6 feet at a time. Make sure you regularly wipe any excess stain that accumulates on the floor. If you are using a sprayer, check your surroundings to avoid overspray onto the house or plants. Scan the area for drips or missed spots before moving on. After completing the railings, double check for any missed spots or drips. Touch these up before the stain dries. Now for the fun and easy part, staining the floor. Make sure you apply in the direction of the wood grain and complete each individual board before moving on. Many stains want you to apply “wet on wet,” which means you apply the second coat while the first coat is still wet or not completely dry. This will be in the manufacturer’s instructions, so pay close attention. 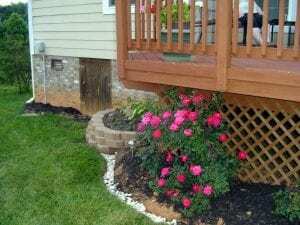 Deck Stain Help tip: It’s not always necessary to apply two coats to verticals/railings. When you’re done, remove all tarps from your plants. If you used an oil-based stain, do not leave oily rags inside the garage or home. Allow for the stain to dry for at least 24 hours prior to placing furniture on the wood. If you have any questions or suggestions for how to stain deck wood, feel free to leave them below along with pictures if you have them. I’ve been using TWP 100 Honeytone on my deck for over 10 years. It works great. I apply it by hand with a brush so I can work the stain into the cracks between the boards. But spending six hours on my hands and knees is no fun. Can I get acceptable results using a pad or some other method? Thanks. How long should you wait to put second coat of stain on deck? Maximum amount of time? The varies based on the brand of stain you are using? Not all are the same application directions.